Can India be the next China or South Korea? 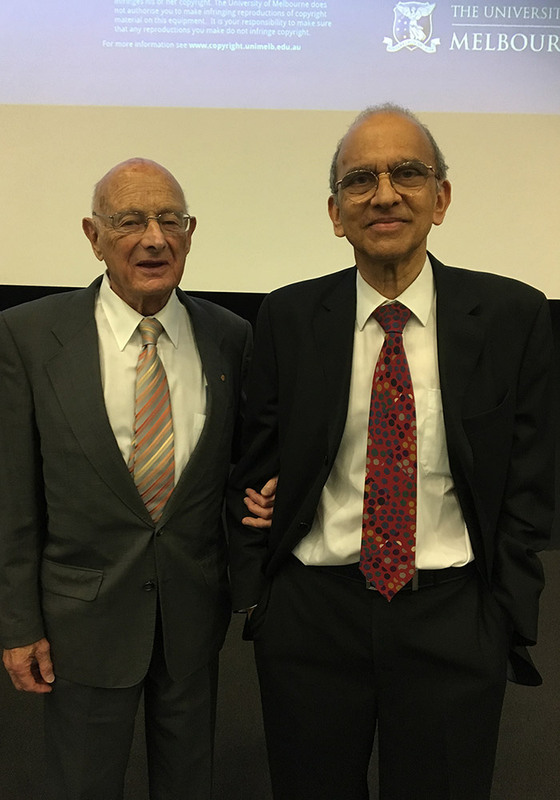 At the latest Corden lecture, Vijay Joshi, Emeritus fellow at Merton College, Oxford University, explored India’s ‘search for prosperity’, considering the opportunities and challenges for the nation’s economy. He introduced Joshi as an old friend and colleague at Oxford. Joshi has been a central advisor on India’s economy, jointly authored two books on the topic and written many articles on development economics. Joshi opened his lecture by saying how remarkable India’s achievements have been in the 70 years since independence. “It was a country which many people thought, at the start of independence, would break up, including Winston Churchill – he said India was no more a unified country than the equator. I hope he’s turning in his grave because India has maintained its unity, in the face of many threats." “It is hard to think of many poor countries that have been democracies that have done so well on the political front,” he added. Max Corden (left) and Vijay Joshi, after the Corden lecture. Economically there have been highs and lows in this enormous country in the last 70 years. Joshi said you can divide the period since independence into two contrasting halves. In the first, “performance was pretty bad, growth was slow at 3.5% per annum” – slow relative to other developing countries at the time and in relation to India’s needs. But, in the second half, after some reforms and liberalisation, growth accelerated, at 6% per annum. Joshi attributed the initial slow growth to “massive low productivity” due to “evasive controls of economic activity, including those on foreign trade”. The difference in the second half of this period was reform. At first hesitant, combined with over-expansionary fiscal policies leading to the 1991 crisis, more decisive reform followed in the early to mid-nineties. “Import controls were slashed, tariffs were scrapped, and so on. The consequences were dramatic and productivity rose rapidly,” said Joshi. 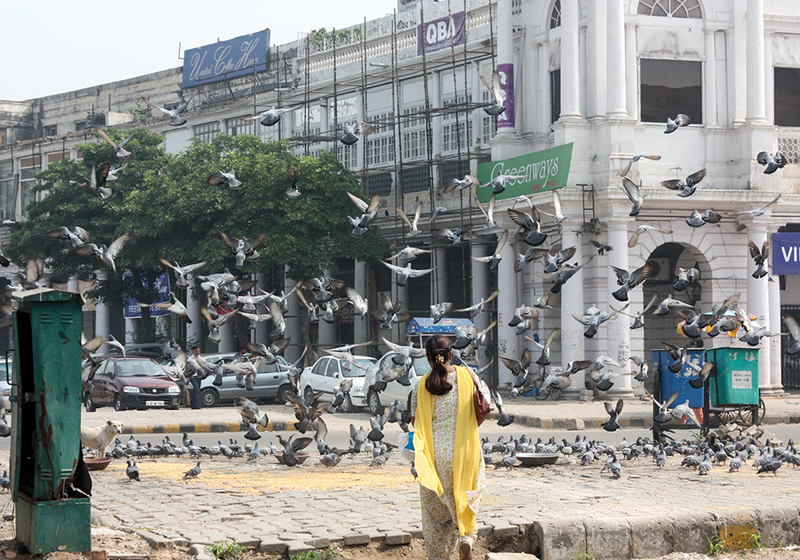 During India’s slow growth period the poverty ratio remained steady at approximately 50 per cent of the population. But in the fast growth period, Joshi explained, the rate dropped dramatically from 50% in 1980 to 22% in 2011. “Today, the number of people living in poverty has fallen from 400 million (in 2004) to 270 million (in 2011). According to Joshi India has the potential to become much more important globally. Even so, Joshi pointed out that India remains “one of the poorest countries in the world, with 20 per cent of the population living in extreme poverty, and another two thirds of the population who are very poor. Despite rapid growth in the second half of the period since independence, Joshi pointed out that growth has “faltered since 2012”. He attributed this to the debt hangover, but also because of a slowdown in productivity growth. 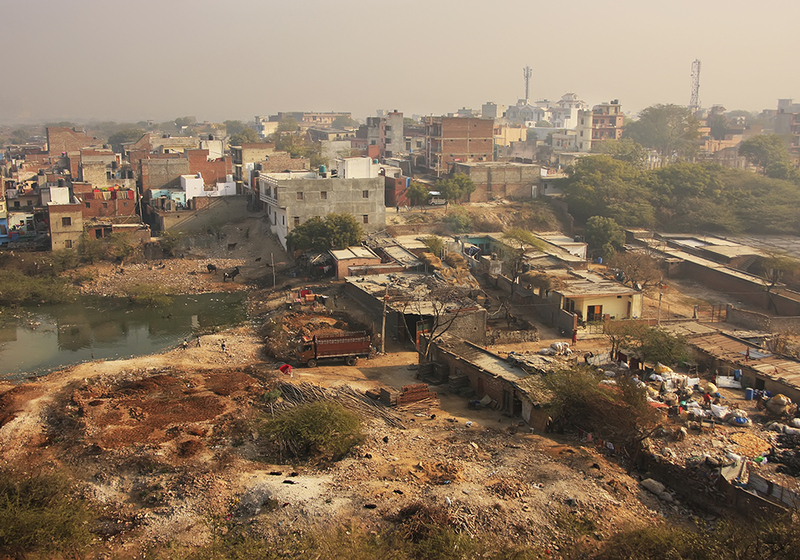 Slums of New Delhi seen from Tughlaqabad Fort, India. “Because reform which took place was partial, incomplete and its effects are petering out, so the resilience of rapid growth is in doubt,” he explained. India’s economy for the last five years has been growing at five per cent per year. Joshi explained that growth of 7-9% per annum is needed to reach the per capita income level of a high-income country in the next 25 years. There are huge opportunities for India in the coming decades, said Joshi, especially as it has “latecomer advantage”. This essentially means that emerging countries “don’t have to invent new things – they can adapt and copy technologies that already exist”, meaning growth can happen fast. That coupled with adapting best practice in technological advancements could see India undergo very rapid growth. “Many of these reforms consist of putting right the balance between the state, the market and the private sector”, Joshi said. “India, in my judgment, is still recovering from a bad case of old fashioned socialism – with extensive state ownership of the means of production and extensive micro-intervention in the economy. India needs to retain liberal democracy but move away from extensive state ownership. "It needs less of the state because the state is over-extended and over-interventionist in areas outside its competitive advantage,” Joshi explained. Radical reform would consist of ending subsidies on key commodities – fuel, fertiliser, rail travel, etc. – so that everyone in India pays market prices. Take away the 6% the government pays in subsidies and compensate the poor with direct cash payments. The basic income supplement would bring India’s 250 million poor up to the poverty line, costing less than one per cent of GDP. Joshi pointed out that other reforms would be needed – including to the employment sector. “India has a huge employment problem… 86 per cent of the labour force is crammed into the low productivity informal sector. “Labour laws are so inflexible no one wants to employ people… In India workers must receive three weeks’ notice to rearrange tasks in a company, firm closure requires government permission." Joshi described the state of Indian primary education as “truly atrocious”. Absenteeism among primary school teachers is 25%, and Joshi said “teachers can’t be fired because of very strong, politically powerful unions. “I think India will run into a very serious capital constraint unless it tackles this,” he added. Watch the full lecture on You Tube. Vijay Joshi's book 'India's long road - the search for prosperity' is available now. Discover the University of Melbourne's program of free public lectures.